On Sunday night, thousands of people including the Dutch prime minister gathered to mourn the victims of a shooting that took place in a shopping mall on Saturday. 17 were injured and six were killed before the shooter turned the gun on himself. 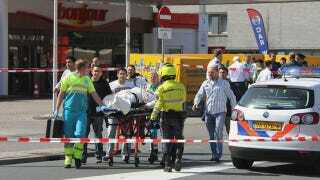 The Associated Press reports that 24-year-old Tristan van der Vlis opened fire at the Ridderhof mall in Alphen aan den Rijn yesterday, shooting shoppers randomly with an automatic rifle. The names of the victims haven't been released, but authorities say they were mainly elderly people who couldn't run, as well as one person who was trying to help others escape. Two children were injured, and 12 people are still in the hospital. After the 10 minute attack, Van der Vlis shot himself in the head with a revolver. Van der Vlis lived near the mall with his father, and had reportedly been depressed. Gun control laws are strict in the Netherlands, and people are shocked that he was able to legally own five firearms, even though he spent 10 days in a psychiatric institution in 2006 under suicide watch. He had also been charged with illegal weapons possession in 2003, but the gun turned out to be an air rifle. "What I can say about that is the broad lines, and this is, of course, very sad for the victims' families, but that no clear motive can be found there ... This man was clearly suicidal, and the contents are more of a spiritual than a threatening nature."